Before we go into detail on what kind of box joint jigs are available on the market, let's have a quick overview on how box joints can be created. How To Make A Box Joint ? Manually - cutting the box joint: If done by hand you mark you joints on both ends of the wood, cut them out with later removing the sockets with a chisel. 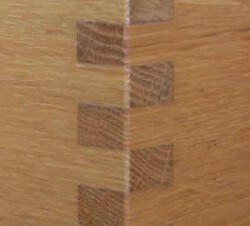 Using a Router: The router is certainly one of the most common ways to cut box joints or any other corner connection such as dovetails or mortise and tenons. While you can make your own box joint jig for your router, I personally favor using a dovetail jig with a finger joint template. Makes the workflow easy and especially when cutting smaller amount of joints, very effective. Spindle Moulder: Certainly one of the fastest ways to cut box joints, since all pins and sockets of the box joint are cut at once. Buy using multiple cutters at the same time, the complete joint gets cut at once. Additionally using a spindle moulder allows you to clamp various workpieces together and cut them in one go. Saves time and permits full precision and fit of the final joint. Band Saw: A rather rough method of cutting box joints is using the bandsaw. Certainly used for box joints where less precision is required, since the band saw blade usually tends to "bend" a bit more vs. e.g. a table saw blade. Table Saw: One of the most common ways of cutting box or finger joints is the table saw. The workpiece is cut vertically over the table. Basically guide by the mitre gauge or if you have - the sliding table of your table saw. While the cut on a table saw is straight vertical and very precise, the "tricky" part is to get the spacing right. Here is where box joint jigs or templates come into play. It may take you some time to master the skill of using a box joint jig without making mistakes, but with some practice you’ll soon be making woodworking box joints like the experts. A box joint jig will make your finger joints in your woodworking projects look professional and will give you a great deal of pleasure as you master more and more complex projects.